In the small village of Hinamizawa, Rika Furude and her friends live together in relative harmony. Beneath this mask of peace, however, lies a hidden darkness, one that Rika understands all too well. In this eternal summer, she has been witness to unspeakable horrors. Every time the clock resets, Rika must try to find the villain behind these senseless deaths before tragedy strikes again. However, trying to decipher a mystery when only half the clues are present proves time and again to be disastrous, and each time she believes that things will change, she inevitably fails. As the annual festival approaches, Rika begins her descent from hope to despair in her struggle to break the chains of fate entangling them all. In this review, I am including both Higurashi No Naku Koro Ni and Higurashi No Naku Koro Ni Kai in my comments. I will be calling the anime simply &quot;Higurashi&quot; in my review to save time. During the few times that I do choose to differenciate between the two seasons, I will refer to &quot;Higurashi No Naku Koro Ni Kai&quot; simply as &quot;Kai&quot;. Story: Higurashi's storyline is stellar. It starts off as a horror/thriller anime where numerous mysteries arise in the small town of Hinamizawa. These mysterious storylines are filled with tension and suspense as the viewer fears for Keiichi's (the main character) life. Since Keiichi is a righteous character who means no harm, the viewer sympathizes with him and fears for his well-being- which is constantly at risk due to the seemingly murderous girls he befriends. Several story arcs arise as we experience Hinamizawa through Keiichi's eyes. Although these storylines may seem slightly confusing and seemingly unrelated at first, the second season of Higurashi ties them all together extremely well (I won't say how because of spoilers, of course). This ability to keep the viewer in suspense and tieing so many intriguing stories together makes Higurashi's storyline extremely engaging, and is my favourite storyline out of every anime I have seen to date. This intricate storyline also carries a heart-warming underlying theme of the importance of friendship and continually shows us extremely hyperbolic possibilities of what the world may become without trust and friendship. I find it particularily interesting that such a theme exists under Higurashi's superficial hack-and-slash plotline. Art: As I read other people's comments on Higurashi's art, I noticed that people generally preferred the second season's artwork more than the first. While the second season's art did seem more well-rounded and fleshed out that season one, I had no major complaints with the first season's artwork whatsoever. Both seasons' art tricks most people into believing the anime essentially a typical harem or shoujo. The shock that people recieve when they see such cute characters are actually involved in an intelligent horror/mystery story is priceless. This is the primary reason for which I feel that Higurashi's artwork is extremely effective. Sound: Higurashi's soundtrack suits the anime extremely well and the only reason I did not give it a 10 is because I cannot remember any specific background music besides Rika's theme. But just because the soundtrack is not memorable does not necessarily mean it is bad. The undertoned, haunting soundtrack is suited so well to Higurashi that it does not interrupt the flow of the anime's plot whatsoever. It only increases tension and suspense as haunting melodies are quietly played on a piano or violin in the background. 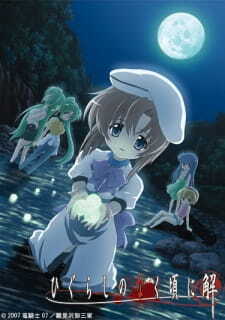 As for opening/ending themes, Higurashi's openings are extremely catchy and memorable. Both are definitely worth downloading onto an ipod or mp3 player (along with &quot;Dear You&quot;, a song from the original Higurashi videogames). The first ending however, did not do anything for me while Kai's ending (Taishou.a) was a lot more pleasurable to listen to. I enjoyed it for it's graceful melody juxtaposed against its rather gruesome lyrics which essentially served as a parallel to highlight the main concept of Higurashi's storyline. This fact alone made Taishou.a an excellent choice for Kai's ending song. Character: Character development in Higurashi is also amazing. The characters interact with each other in a very natural, human manner and their personalities are not sterotypical in the least. In the first season, Higurashi's character personalities are also quite complex and can keep the viewer guessing at characters' true personalities and motives for episodes upon episodes because of how mysterious every character is (with the exception of Keiichi). During Kai, the characters often adopt a more optimistic or positive outlook on everything as a result of their efforts to work together against a common enemy. Overall: My favourite anime series. If you have not seen this, please watch it IMMEDIATELY! The world needs more Higurashi fans. Also, I am aware that a third season of Higurashi will be released sometime this year and I am anxiously anticipating its release. Hopefully, it will explain what happened at the very end of the second season, since I was left feeling fairly confused... but that might just be because I was too stupid to interpret the ending accurately O_o Thanks for reading, I hope it helped! I will say this now, if you have not seen the anime called Higurashi no Naku koro ni, then this review will be as useful as the dust that lies under your bed. With that said, most of what I have to say about Kai will be a rehash of what I said in my season 1 review; therefore, I will not be giving a detailed review. Instead, I will say what I thought were the stronger aspects in Kai compared to that of the first season. No doubt, both seasons of Higurashi were wonderful and one cannot exist without the other. Because of this, it is not exactly fair for me to use the same criteria I use with a stand alone season series or a stand alone anime. Thus, I rate and review Kai based on what was different, whether it be an improvement or not, from season 1. Story: As said earlier, Kai is a direct continuation of where season 1 left off. Kai shows the last two answer arcs of Higurashi plus an anime-exclusive arc to fill up the holes to answers that were missing from season 1. Every mystery or question posed in the first season is answered nicely. The way everything falls together is very well thought out. The solutions provided to the mystery leaves very little things unanswered. Art/Animation: Vast improvement in the art department from the last seasons. Animation, however, while it is much better, can still be inconsistent. Well, Higurashi was never known for its animation, and it does its job fine without KyotoAni, Bones, or Madhouse quality animation. Sound: One aspect of Kai that was the same as the first season. The first season had an OP that matched very well with its atmosphere and mood. Kai was no different. Instead of the creepy, unsettling feeling, Kai uses an OP the shows the drama and desperation of Rika's struggle. The voice acting is still superb, and besides the major theme that is used in Kai and some new tracks, the music remains the same. Characters: I found the character development to be better and given more time in Kai. While the first season introduced and partially developed the characters, they are fully fleshed out in Kai, especially Rika. Even the characters that you think played minor roles in the first season, Akasaka, Tomitake, Takano, Irie, and Ooishi, gets a good deal of development. Enjoyment: While I had a lot more fun brainstorming theories and (sometimes, not always) being confused, I enjoyed Kai for other reasons. Firstly, I loved Minagoroshi-hen. It is, no doubt, my favorite Higurashi arc. While some people might enjoy watching psychotic girls beat the hell out of a certain, horrible uncle (I mean, who does not? ), I had just as much fun watching Keiichi give his epic speeches. After all, Keiichi is called the Magician of Words for a reason. I also enjoyed watching as everything unfolded. Imagine you are an Olympic boxer, about to enter the gold medal match. It's going to be you're toughest fight, the world title holder thrice in a row. You've studied his moves, you're prepared, you know you can win and relish the challenge. You enter the ring and prepare for the greatest fight of your life. The bell rings! You launch forward... only to find your opponent collapsed on the ground due to a heart attack. You won! But what's the feeling? Elation? Disappointment? Or a weird mixture of both? You brace yourself. You know what the characters you've grown to love are up against, you know it'll be an uphill struggle. Yet, you know that with their sheer brilliance, they'll likely succeed. The three final episodes are finally here, and you prepared yourself to wowed, just as you were for the past 26 episodes... eager to see just what ingenious plan Kiechi and his group of resilient girls have brewed. Then... suddenly, you're watching something the looks like came straight of Home Alone. The antagonist's forces, always so powerful, so disciplined, and so deadly, has magically transformed into a mob of bumbling fools. The comedic, idiotic and pathetic ways in which the villains appear totally out of place. Its like watching Terminator, where after surviving massive explosions and shot gun shellls to the head, Arnold suddenly got killed by a Knife in the gut. You scream `WTF?'? Where's those snipers? Where those silencers? Did all the villains just drop themselves in a a barrel of toxic goo and had their IQ reduced by 50? It seemed like he writers just run out brilliant ideas something so powerful could be defeated... and decided to take the easy way. This a true pity, given that the second arc was a true masterpiece, one-upping everything in both seasons combined. In the end, a final rating for Higurashi ni Ki difficult to give. Up till the final episodes, the series deserves a 10/10. The meets, and even surpasses the incredible standards set by the season before. They have managed to construct a mystery that is unpredictable, and yet fits naturally with all clues given before, creating that elusive `Eureka' moment that is almost magical. Yet, Higurashi fumbles at the critical moment, where the protagonists must use this knowledge to change their hellish destiny. The ending episodes are not bad (They deserve 7/10), but look immeasurable weak when compared to the hand standards set before. Is it worth watching? Absolutely! Is it an masterpiece? Almost. But just like seeing Terminator die to a knife wound, one just cannot help but feel a little disappointment at the ending and endings tend to have a last impression. After finishing the first Higurashi series, I was actually looking forward to seeing what Kai had in store for me. Despite my dislike of the horror genre, I was more than willing to give this one a chance too, since I was proven wrong by the former. I was proven wrong, all right, but it was not for the right reasons. Where the first Higurashi was centered on shocking the viewer at every turn, Kai went for a slower, more suspenseful approach. Because of this decision, this approach turned out to be exceedingly slow. With only two major arcs present and twenty-four episodes to use, many events were stretched out beyond their limits. There were several occasions where the story virtually stalled for two episodes at a time with almost nothing being accomplished. Perhaps because of this, the twists that were thrown in became more surprising. There were just enough of these to help me see this series to its unexpected end. Luckily, thanks to this pacing change, I did see some good come out of Kai. With several major questions raised at the end of the first Higurashi, the series took each one and explained the reasoning behind everything clearly. I can safely say that I had no further questions about any past events when the final credits rolled. There was one other good thing about this slower approach; something that I didn&rsquo;t expect. The amount of back story given was a rather nice treat. Most of this was focused around Takano, someone that barely received any time in the first season, but proved to hold much more that what I saw previously. Her story was more compelling and memorable than the actual plot ever was at any given point. Throughout the entire run of Kai, there seemed to be something missing. The sense of paranoia that was so prevalent in the first season was absent. Granted, this had to do with the focus shift, but there still could have been a way to keep it in the plot. Without the constant fear that someone or something may be lurking around the corner, this series felt rather dull outside of Takano's story. At least the beginning and ending of each episode is enjoyable with the new opening and ending themes. When all was said and done, I could do nothing but sigh. The ending may have been satisfying, but I still wanted more. Despite my distaste for graphic violence and horror, I actually wished that it were there from the beginning. That, my friends, is saying something. It's slowly become one of the most popular archetypes in anime, but what exactly does yandere mean? From past favorites to horrific newcomers, this list contains the best of of the best yandere in anime history and present.